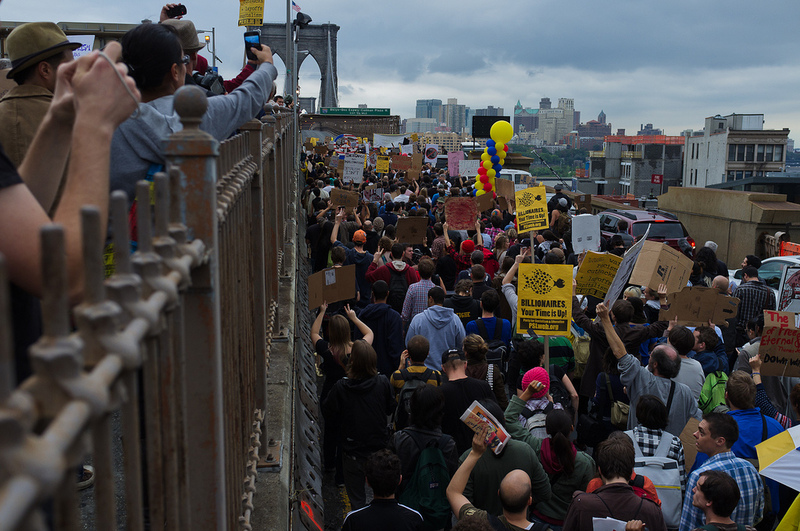 NEW YORK (Frameshop) – One of the initial goals of non-violent street-level protest is to elicit from the status quo the very problem targeted by the movement. March against colonial repression: elicit repressive colonial violence. March against racism: elicit brutal racist violence. March for women’s rights: elicit misogynistic hatred. The examples are endless. Almost every protest movement achieves this same initial goal because the status quo targeted always resorts initially to the very tools that keep the status quo in place: ridicule, disdain, violence. NEW YORK (Frameshop) – One of the aspects of the Occupy Wall Street movement (OWS) the mainstream media has failed to grasp is the extent to which it has generated an almost continuous string of protest innovations, some of which reveal a great deal about the issues motivating people. One example are the “We are the 99%” self-portraits circulating the internet. As of the writing of this post, a site by that name has collected almost 1,000 of those self-portraits, all of which follow the same general format: a person posing with a hand-written or typed note describing the personal devastation the American economy has visited upon their lives.